The NY Times published the results of a fascinating research project a few days ago. Entitled The Follower Factory, it describes a firm that gets paid to add followers to your Twitter, Facebook and other social media accounts. Shocking, right? What is interesting and new about this report is how far a scam artist will go to replicate real users data profiles, such as their face, background images, user name (with homographic substitutions to make it harder to distinguish from the original account owner), and biographic data to make the purchased followers seem more legit. Many celebrities – or would-be ones anyway – have bought massive follower lists in the attempt to boost their own brand. It doesn’t work, and most of these efforts ultimately fail. 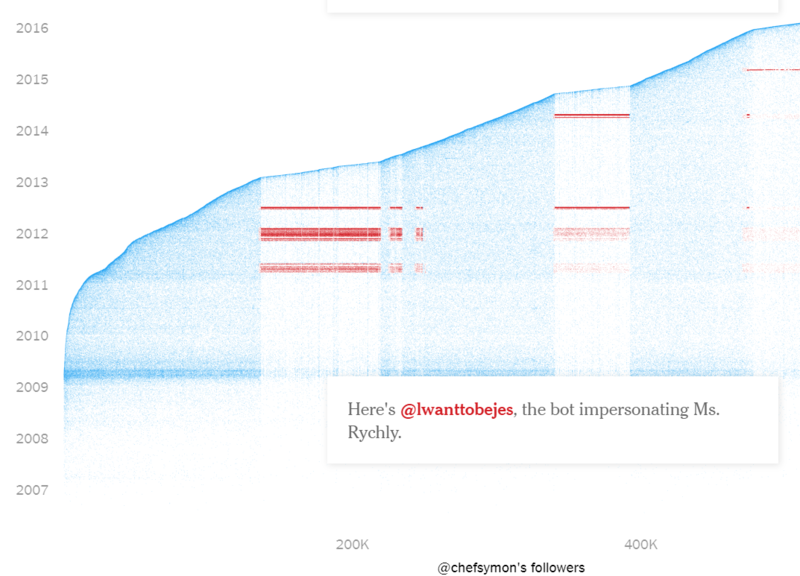 The NYT piece goes into detail, showing how different automated bots can be used to create seemingly human Twitter accounts. 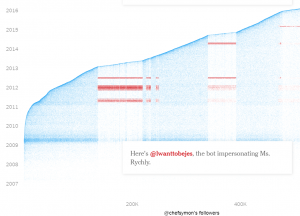 While most of them aren’t worth the electrons that are consumed, there are some useful Twitter bots such as those that can detect emergency situations or track other newsworthy events. 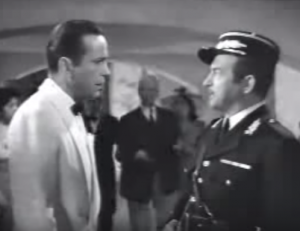 The piece also describes a dissatisfied employee from the original scammers who left to start his own venture, copying his former employer’s tactics. On the Internet, no one knows how low you can go. Real social media influencers get that way through an organic growth in their popularity, because they have something to say and people respond to that over time. There is no quick fix for providing value. If you buy a bunch of followers, the “real” followers will go elsewhere. If you try to game the system, ultimately the folks who are just creating solid content will show these con artists up. Sadly, this is nothing new. My podcasting partner Paul Gillin wrote about this more than six years ago about the flaws in Klout scores, which was a darling back then. But the link between people who spent a lot of time massaging their Klout data and higher scores troubled him then, and still does. There are more recent metrics to try to measure social media influence, but they are just as flawed. Let’s try to forget that we can distill influence into a single metric, and instead look at what the best influencers are trying to do. Interestingly, Gillin wrote a book on the topic more than ten years ago. Be first. If you can be the first place someone sees some valuable information, people will notice. Say it best. If you communicate more clearly, effectively, or insightfully about a topic of general interest, that’s a big value add. Notice what is different about this list? Everything you can do here doesn’t cost money, but it does take time and you need talented people who aren’t just cutting-and-pasting from across the Interwebs. Too bad that message isn’t clear, years after the web and social media first became popular. This entry was posted in marketing by dstrom. Bookmark the permalink.